While we were in Madrid we were told we must see Toledo, so that’s what we did. Oddly enough that’s our schedule nowadays; if we see a place that isn’t too far than we do our best to visit it. For the organized perfectionist that might sound like a nightmare, but it’s liberating to do things spur of the moment. Also, we don’t plan that far ahead anymore because it takes too much time and we don’t really know what we’ll we be in the mood to do when we get somewhere. What’s so cool about Toledo? Puente de San Martín, and his brother Puente de Alcantara (left) – a medieval bridge that spans over the River Tagus where people can zip-line across for under 30 seconds. 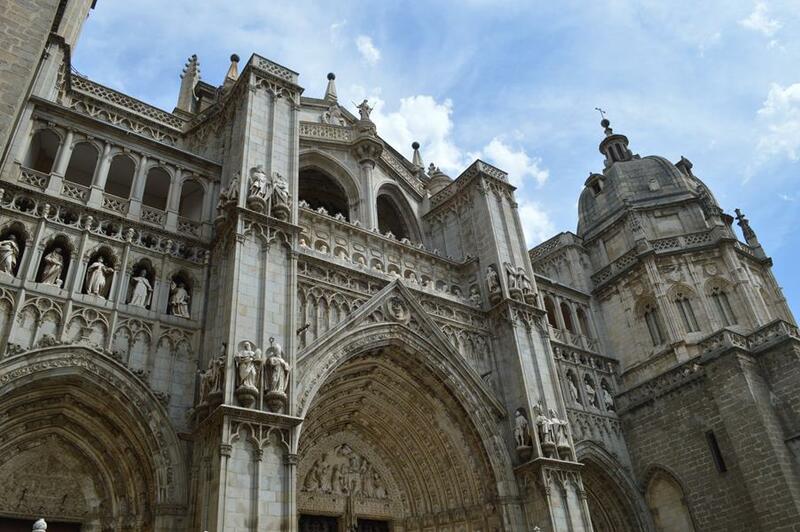 Toledo Cathedral (right) – a Roman Catholic Cathedral built around 1500. The carving on the outside was incredible! Alcázar of Toledo (bottom) – the architecture wasn’t so impressive as the perfect placement of this once Roman Palace. 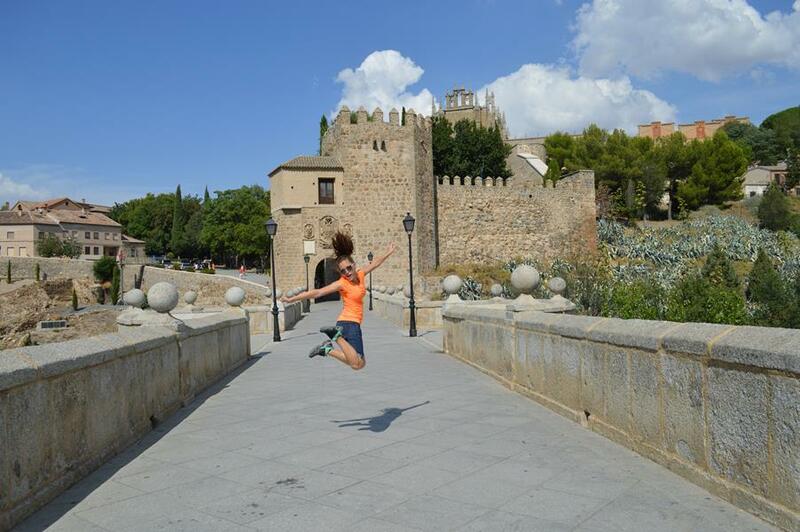 The fortification stands on the highest part of Toledo and it looked awesome above all the surrounding structures. Pablo and I are always impressed with medieval castles and architecture so since a lot of Toledo had this style we were satisfied with our choice to see it. How does one get to Toledo? There are many tour buses (€25), all of which seemed to include a train that towed you around Toledo once you get there. This would have been nice because there were a lot of hills! We pretty much snacked and walked around the whole time, but somehow seemed to quickly pass the hours by. I’m not sure which won overall, the amount of food we ate or the walking we did, but I’m going to take a gander that walking combined with the sweating made it so that our calories burned versus gained ended up even that day. We tried our first churros con chocolate which turned out to be the epitome of deep fried and smothered in chocolate goodness that someone on a diet should run away as fast as possible when they hear the name. The sandwiches were good too, one of which being a bocadillo de tortilla that people recommended for us to try. It tasted fine, definitely depends on where you try foods of course and can’t make a judgement based off of one food place. So when in Madrid make sure to plan a stop to Toledo and throw the “Holy Toledo!” phrase around to find any reaction from the locals. Are you going to use the phrase, “Holy Toledo” now? If only I could! 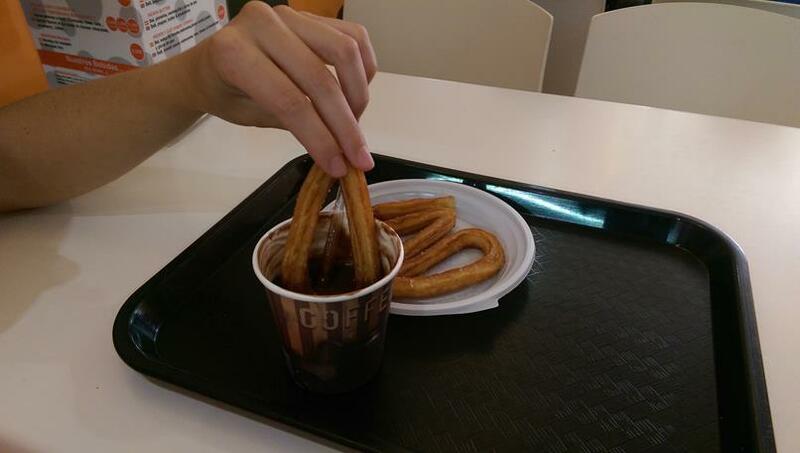 If anyone could make churros con chocolate on their own though it would be you!